Back in July, I took a "momcation" to Newport, Rhode Island to visit my friend Lindsey. It was three nights away, and it was really, really great. Kenny was about five months old at the time, and it was the longest I'd been away from him ever. It recharged my batteries, allowed me to give attention to my friendship, and I had more energy and excitement about coming home at the end. I highly recommend it! It's also important to me to role model for Kenny that I'm independent and have interests and activities outside of my relationship with him. Linds picked me up at the Providence airport in her gorgeous convertible, and from that moment on, it was top down, sunshine ON! I flew in on the 4th of July, so some grilling out and fireworks were in order. But first, we were HUNGRY! So Lindsey took me to one of her all-time favorite nostalgic Newport spots: the Castle Hill Inn, est. 1875. Gor-geous. Their beautiful lawn and terrace have incredible water views, so we got a table to have lunch and a cocktail al fresco. 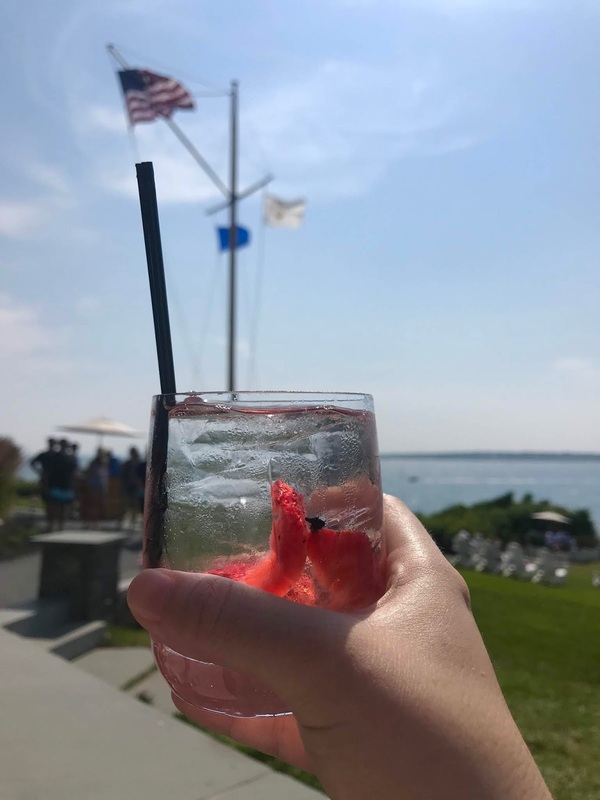 I enjoyed a wine spritzer, because they're totally underrated and perfect for summer day-drinking, as well as their chicken al mattone, with heirloom tomatoes, burrata, and a roasted tomato vinaigrette. And of course, since it was my first visit since Linds moved to New England, we had to share a dessert. It was some kind of incredible funfetti cake-inspired layered magic, with delicious whipped cream and raspberries! After that, we retired to relax at Lindsey's house, which had a rooftop porch with water views and the perfect fireworks vantage point too. We drank rosé and grilled out for dinner, capping off a beautiful travel day for me. 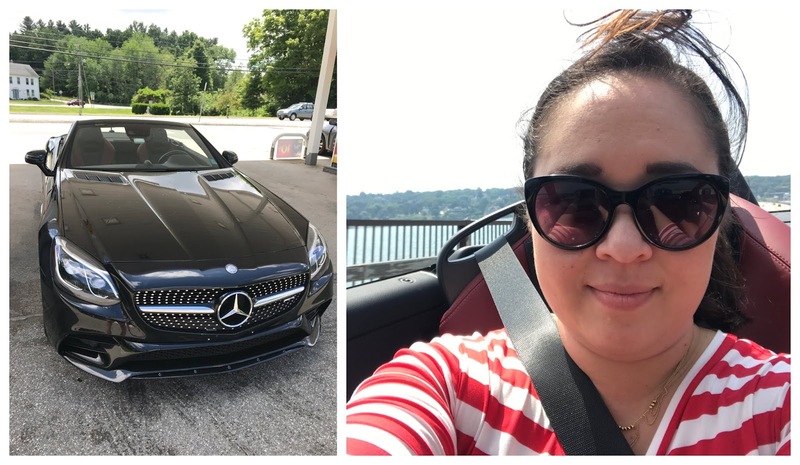 Over the next few days, we took a road trip to West Hartford for some real estate shopping (spoiler alert: Linds lives there now!) as well as took in the wharf and seaside in Newport. 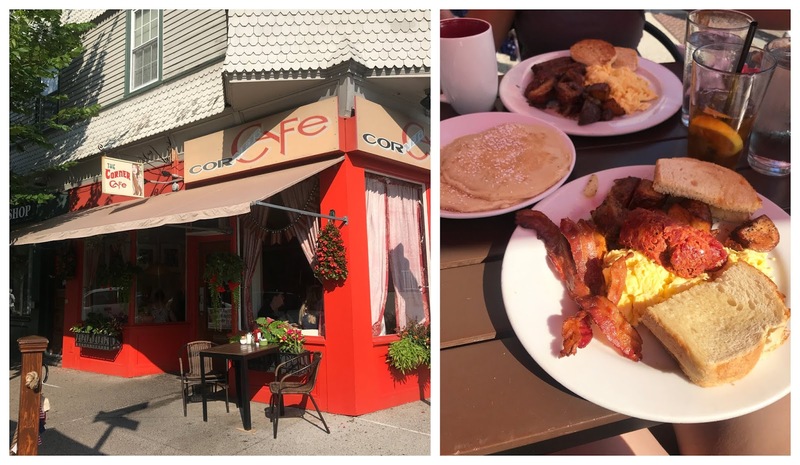 We had a delicious breakfast at the Corner Cafe; the portions were huge, and the menu was full of Irish, Portuguese and West Coast influences. It's the kind of place where you find black & white pudding, chourico, and breakfast burritos on the same menu, and it works! While at the wharf, I enjoyed seeing gorgeous yachts and adorable shops. I even visited the original Alex & Ani storefront and bought two bracelets to commemorate my trip. 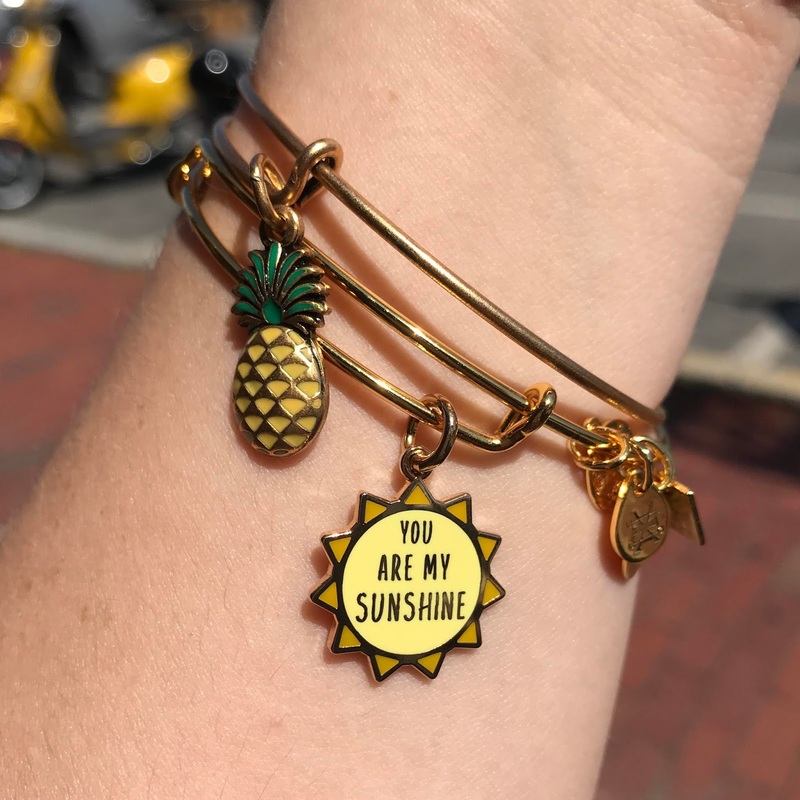 The pineapple represents my friendship with Lindsey, and the sun represents a song I like to sing to Kenny. Together, they remind me the importance of love and relationships in many facets of life. One of my favorite things during our trip? Touring The Breakers mansion! I love The Biltmore in Asheville, and so I wanted to tour at least one mansion in Newport. 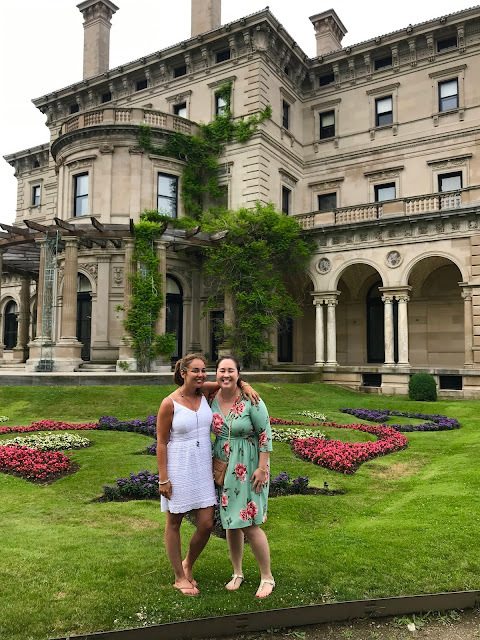 The Breakers is part of the Vanderbilt family empire, so it was the perfect one for my visit. These incredible mansions not only have ocean views, but the exteriors and interiors are luxurious and high-end. I can't believe these were considered summer homes, versus permanent residences! Very Downtown Abbey. My getaway to Newport was perfection. 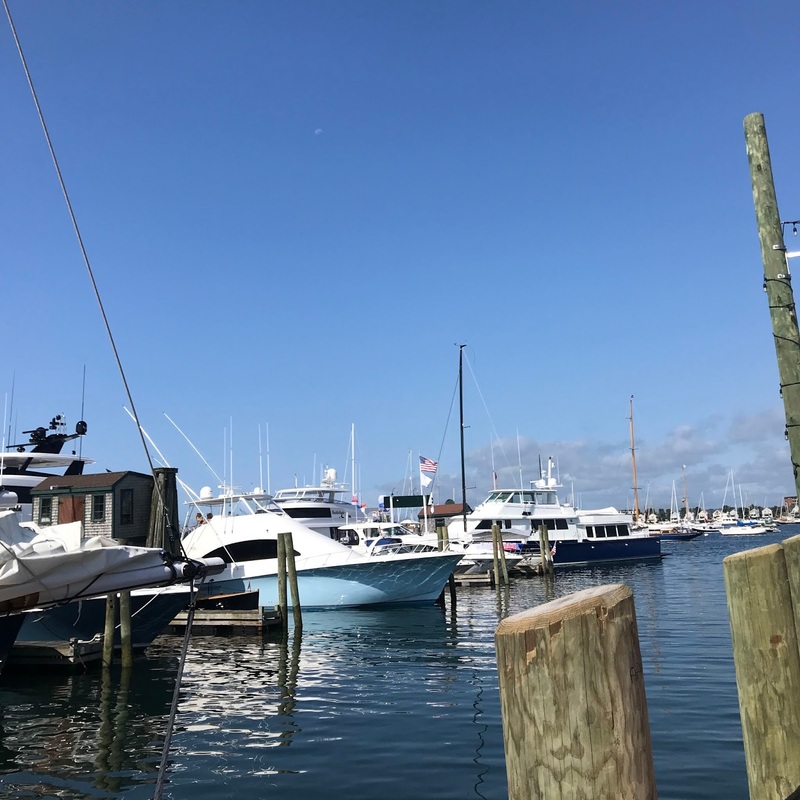 I enjoyed the company of my friend, the delicious food, refreshing drinks, beautiful homes and seaside, and overall New England charm. I felt so refreshed and happy when I got home, and I'll always have these beautiful memories of my first real trip post-partum.